It's my first finished sewing project of the year! Yay! This project was thrown together in a desire to make up a new-to-me pattern and I'm so glad it all came out well. My favorite features of this design (and what made me want to get the pattern) are the colorblocked yoke and the button sleeve cuffs. Aren't they cute?! Yay buttons! I may have loves of knit shirts in my handmade arsenal, but none with those details. My Craftsy shipment happened to arrive on my day off, so I immediately traced off a size 16 bust and graded to an 18 hip according to my measurements. Since this is an indie designer, I figured it wouldn't have as much ease as the Big 4 patterns do and I trusted the size chart. 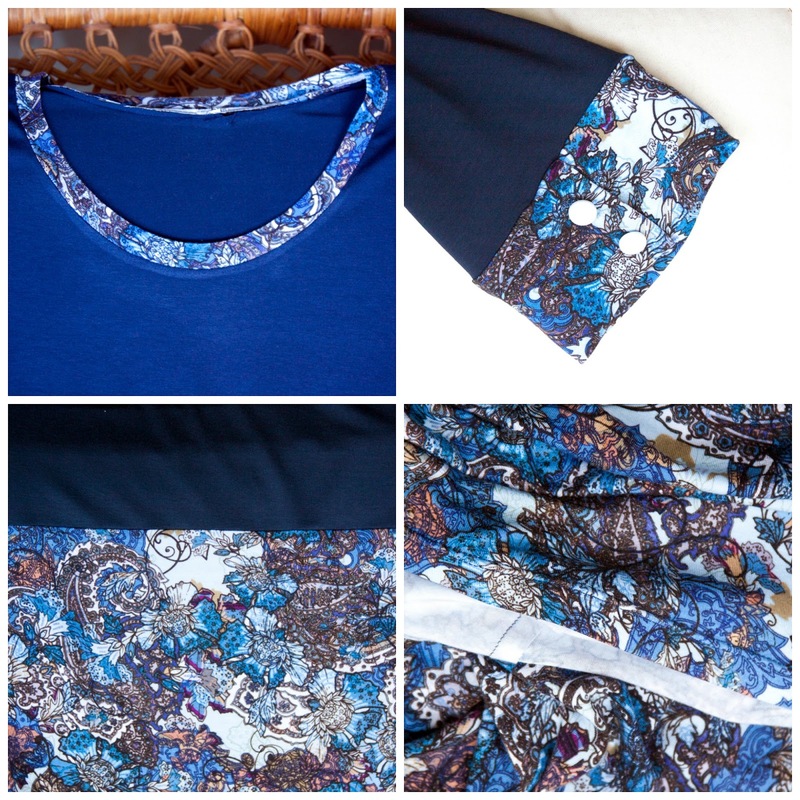 I was working completely from my stash since this was such a sudden make, and I really loved the idea of finally using this paisley floral rayon knit I bought as a remnant from Joann's a while back. It was only a 3/4 yard piece, but being 60" wide and so cheap I decided to grab it in hopes of using it for something with colorblocking someday. Yay for ideas coming to fruition! It's a lovely fabric that's super soft with lots of swingy drape - perfect for a shirt with a loose fit. When I decided on using the floral knit, I pulled out all the solids in my stash that might possibly go with it. My main choices were medium gray, black, and navy - as you can see the navy won out. I liked how the navy let the blue in the design pop a bit more. The navy is a Maggy London rayon jersey I got online from Fabric Mart a while ago (they no longer have it, but it's a nice fabric). 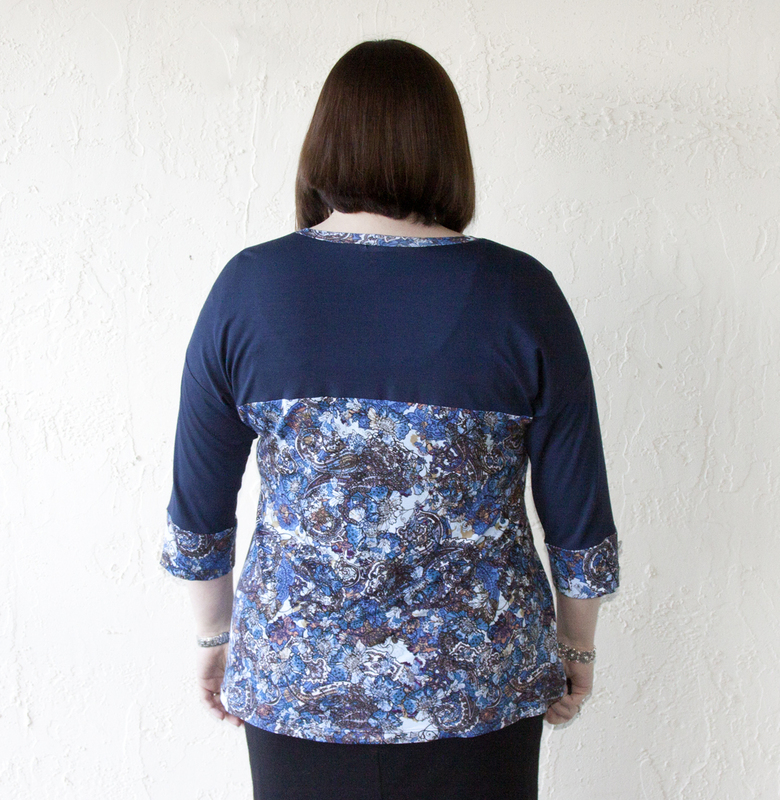 When it came time to make the neckband, I decided to go with the floral knit mainly because I didn't want to use too much of my navy fabric, lol, but I like how it turned out. I think it ties it all together. Now that I've talked about the good, let's talk about the not so good. I'm still not sure about the drop shoulder design on me. I have very sloped shoulders, so anything dropped usually makes me look like a hunch back. I don't get quite that vibe here, but what I do get is a major bat wing arm pit - which I am not a fan of. I like the top just fine until I raise my arms at all. I can't decide if the top is just too big at the bust or if that's a design feature and meant to be this loose. In this drapey rayon fabric I think the looseness works, but if I made this in a cotton I think it might look huge. I'm sure I'll find that out in the future sometime. I also don't love the placement of the yoke seam - personally I think it should be about 1 inch higher - that was something I feared from looking at other's finished projects before making this, but I decided to just make it as drafted and see for myself. It's not a deal breaker by any means, and I still like this top, but next time I will definitely raise the seam at least 1 inch. As far as pattern instructions go, these were great. 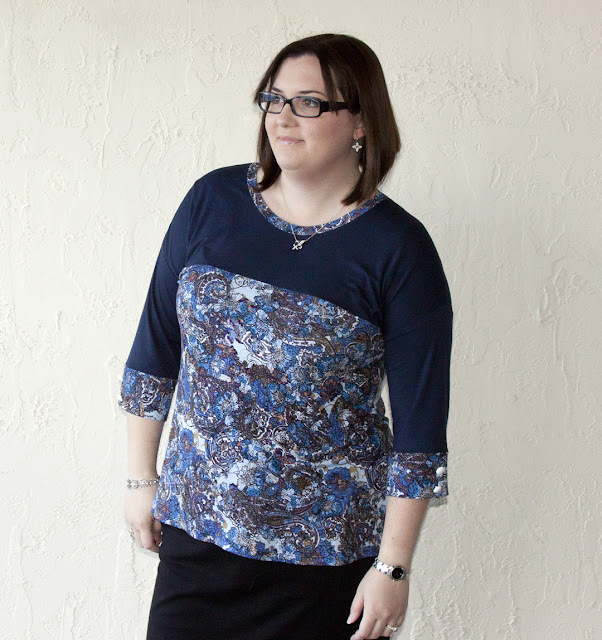 Everything was clearly explained with diagrams to show you what to do, so even a complete beginner to sewing knits could easily make this top. I will say that this is the first time I've sewn a knit neckband this way, and I had my doubts at the time, but other than the pressing marks around the neckline it looks great. Overall I'm really pleased with this top :) It had it's issues, but for it technically being a muslin I'm thrilled it turned out so wearable. I definitely have plans for more tops like this - I just love those button cuffs! I'd love to go full Breton style and make a striped version eventually. With a few tweaks, I think this could become a new tnt pattern! Thanks so much :) I love it too! This Marianne came out lovely! Love the blues on you. That's so nice of you to say :) Thanks!